Houston formally launched its PACE program on Wednesday in a ceremony lead by Mayor Turner in the Legacy Room of City Hall. PACE stands for Property Assessed Clean Energy. The voluntary program allows for buildings to finance energy and water efficiency improvements with private sector funding. The funding is then assessed as a senior lien on the property, which is why the city or county must establish the PACE programs. This allows for longer term loans, up to 20 years. Property owners can make their improvements with no upfront capital and ideally their payments are designed to be less than the anticipated energy or water savings resulting in a positive cash flow. The Texas Legislature passed the bill authorizing taxing entities to establish PACE programs in 2013. 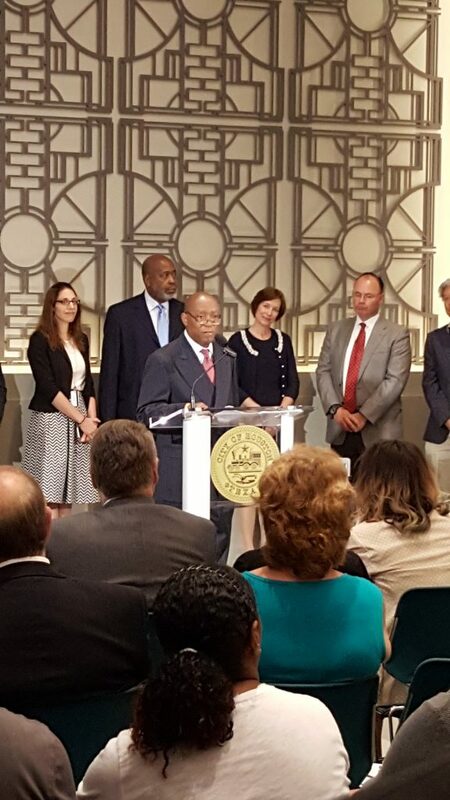 Mayor Turner voted for the bill twice while serving as a state representative, so it was fitting that he be able to formally launch the program. Mayor Turner noted that if only 3.5 % of commercial properties in Harris County participated, it could result in a savings of $650 million in energy reduction. Currently $100 million of commercial projects in the works and there is a huge potential for savings in the industrial market. One of the first projects is energy efficiency improvements at the Rice Temple Baptist Church. Deacon Herb Yuan said that PACE will enable the church to do their entire project at once instead of in phases. With no initial capital cost, the improvements should halve their energy costs. John Hall, of the Environmental Defense Fund said that Texas has the highest potential of all states for energy reduction in renewables and demand reduction and the PACE program could result in billions in savings. Charlene Heydinger is the President of Texas PACE Authority which will administer the program for the city. Charlene has been a tireless promoter and advocate of PACE for years, yet she used her time at the podium to thank Steve Block of Thompson & Knight for establishing Keeping PACE in Texas. This non-profit organized the creation of the “PACE in a Box” toolkit that standardizes the PACE program. This standardization makes for quicker program establishment by local governments and provides consistency for lending institutions. Dub Taylor, Director of the State Energy Conservation Office is optimistic about how effective this structure can be for the private sector as he has seen the success of the state’s similar LoanSTAR program for public properties over many years. The Houston program represents the sixth PACE program established in Texas.